Design your very own Custom Wall Plate with ease. Simply select your colour preference (either black or white), then select a wall plate with 1, 2, 3, 4, 5 or 6 available inserts. Next, choose the desired inserts, click into place and you're done! Architrave and Blank Wall Plates also available for even more customisation options. These wall plates are designed to match the Clipsal 2000 Series. The rounded edges look great with a modern appeal sure to match any home. Looking for matching inserts? Please visit our Wall Plate Inserts category. This White Architrave Custom Wall Plate will accept 1 Insert. This product features a discreet and compact design to make it the ideal choice for a range of installation requirements. Make a selection from our range of custom inserts to complete your design. 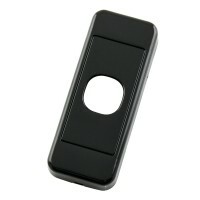 This Black Architrave Custom Wall Plate will accept 1 insert. The unique modular system with simple click into place design allows quick and easy customisation. Design your own wall plate to suit a range of installation requirements with our range of inserts. This White Architrave Custom Wall Plate will accept 2 inserts. The compact design makes it the ideal choice for a number of installation requirements. One of the more popular is to connect surround speakers while maintaining a discreet finish for your Home Theatre. 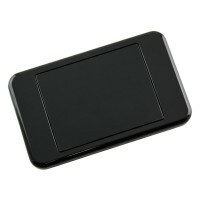 This Black Architrave Custom Wall Plate will accept 2 inserts. This wall plate offers the perfect solution for a range of custom installation requirements. For example, connecting rear surround speakers or any other scenario which requires a discreet finish. This White Custom Wall Plate will accept 1 insert. This wall plate is designed with simplicity in mind. The unique modular system allows you to select whichever insert you require from our extensive range. 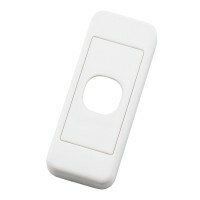 Simply click this into place and the wall plate is ready to be installed. 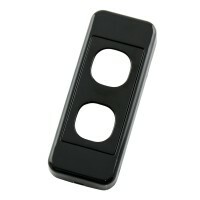 This Black Custom Wall Plate will accept 1 insert from the large range available. Design your very own wall plate with ease by selecting the required insert, then simply click this into place and your work is done. Fast, simple and easy. Features a high gloss black finish. 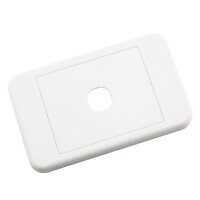 This White Custom Wall Plate will accept 2 inserts. If you are looking for a wall plate which provides quick and easy customisation, then look no further. Designing your own custom wall plate could not be easier than what is on offer with this unique modular design. 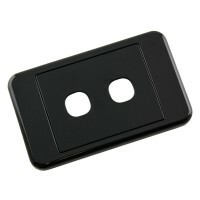 This Black Custom Wall Plate will accept 2 inserts. Looking for an outlet to express your creative genius? These fantastic wall plates are the answer. Select up to two inserts from the diverse range available, click these into place and your masterpiece is complete. 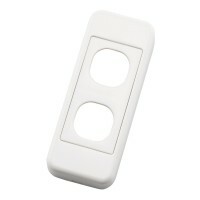 This White Custom Wall Plate will accept 3 inserts. Designing your own custom wall plates could not be easier. Simply select up to three custom inserts from the extensive range available and you have a wall plate perfectly suited to your requirements. 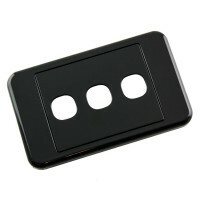 This Black Custom Wall Plate will accept 3 inserts. If you're finishing off your new home or perhaps renovating, obtaining a premium finish is a priority. These wall plates provide flexibility with style to match. Simply select up to three custom inserts and you're done. 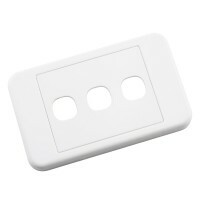 This White Custom Wall Plate will accept 4 inserts. If you're looking for a wall plate that can be customised exactly to your specific requirements, then there is no need to look any further. 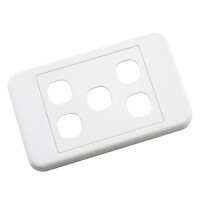 This superb wall plate is the ideal solution and makes this task simple and easy. 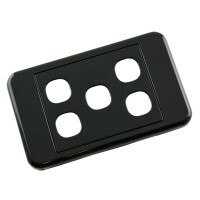 This Black Custom Wall Plate will accept 4 inserts. The unique design of these wall plates can be summarised in one word, superb! The high gloss black finish would look fantastic in any Home Theatre or a range of other installation requirements which require a darker finish. This White Custom Wall Plate will accept 5 inserts. The unique modular system makes designing your very own wall plates a breeze. The simple click lock system ensures that complete customisation with up to five inserts can literally be achieved within minutes. 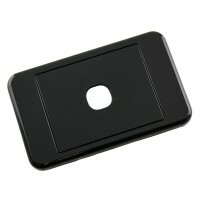 This Black Custom Wall Plate will accept 5 inserts. The stunning high gloss black finish looks superb in any environment. Add this to the fact that you can select up to five inserts from the diverse selection available and it is easy to see why this is such a popular choice. 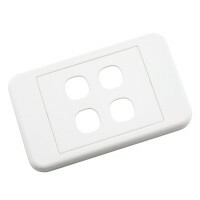 This White Custom Wall Plate will accept 6 inserts. Unleash your creative genius with this superb looking, yet elegantly simple wall plate. Simply select up to six custom inserts, click these into place and this wall plate will be complete and matched to your requirement. 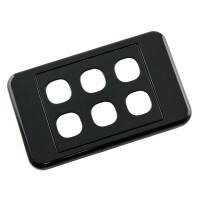 This Black Custom Wall Plate will accept 6 inserts. If you're looking for a darker colour, this wall plate cannot be surpassed for aesthetic appeal. This wall plate also provides the flexibility of being able up to accept six custom inserts from our diverse range. This White Custom Wall Plate features a blank face plate which could be used as a placeholder for any wall plate no longer in use within your home or office. Alternatively, you may decide to create your very own custom design with this affordable option. 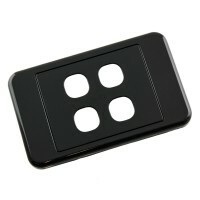 This Black Custom Wall Plate with a blank face plate is designed to provide flexibility. 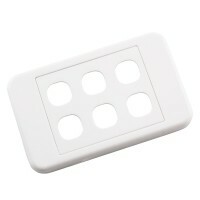 This handy blank wall plate can be used this to fill in the space for wall plates no longer in use. Alternatively, you can unleash your creativity to design your very own wall plates.